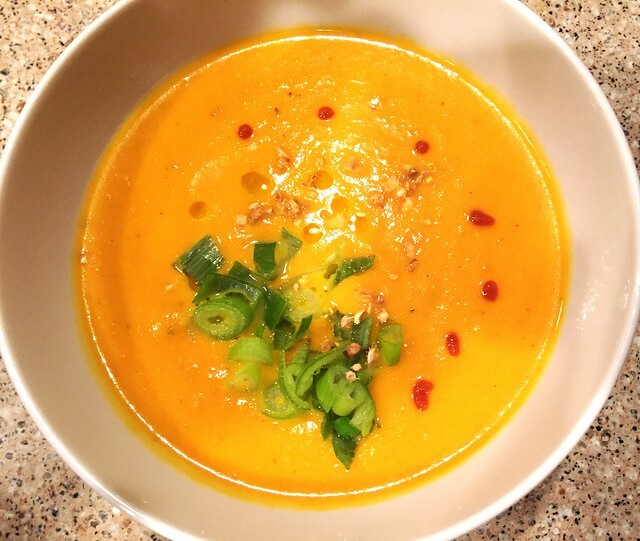 Carrot Coconut Curry Soup might not be the recipe you were expecting to see the week of Christmas, but it might be the recipe you need. When life gets busy and crazy, I tend to make soup. Not just because it’s comforting and warm (hello, I just turned my AC back on today after what was apparently our one day of winter), but because it’s easy, quick, and can feed you for several meals. 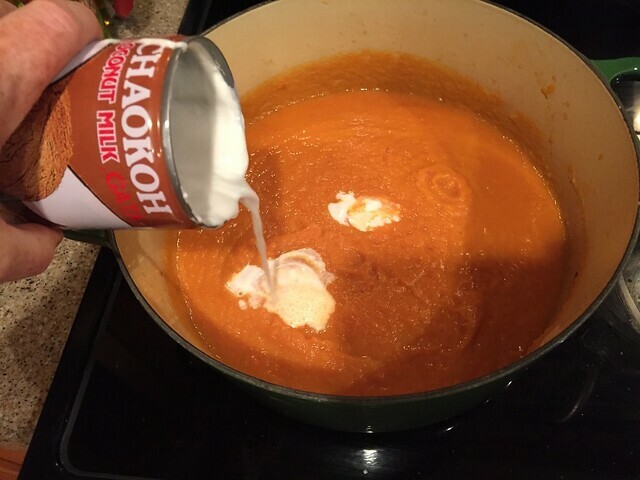 I like to have soup in the fridge to grab for a quick lunch or pop into a thermos to drink on the go. 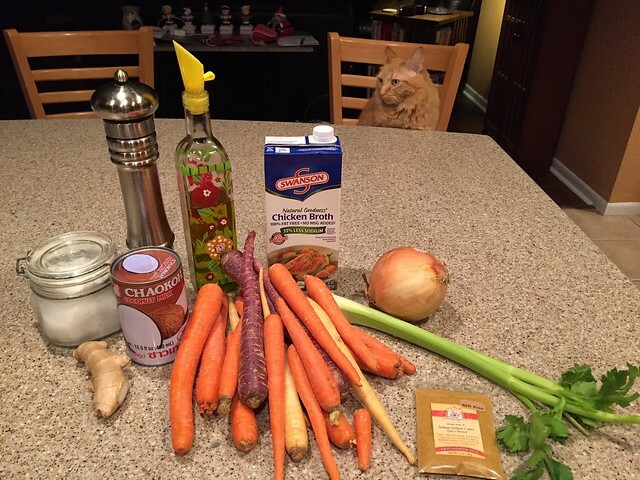 Plus with all the holiday excess, it’s nice to have something light and healthy like Carrot Coconut Curry Soup in the rotation. With all that if you still need more convincing, I’ll also tell you that Carrot Coconut Curry Soup tastes AWESOME! Carrot/Ginger colored cat optional but highly recommended. You can also add fun garnishes the soup like green onions, cilantro, parsley, a drizzle of basil oil or squirt of sriracha sauce to spice things up. Use whatever you happen to have on hand or just eat it as it comes out of the pot. 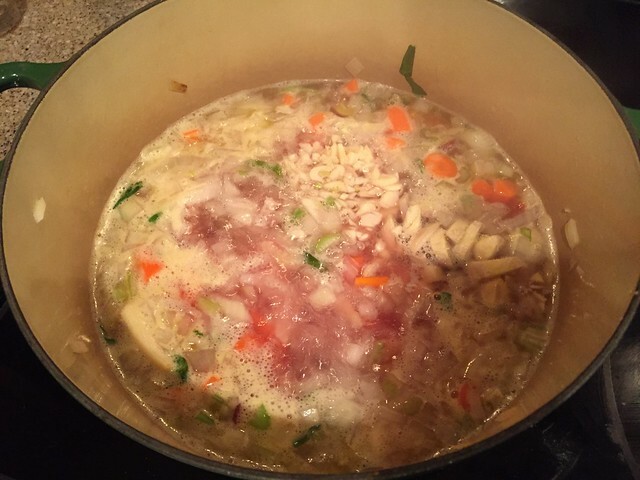 A little chopping…this soup will eventually be blended so perfect chopping is not necessary here. Roughly chop 1 medium onion and 1 rib of celery. 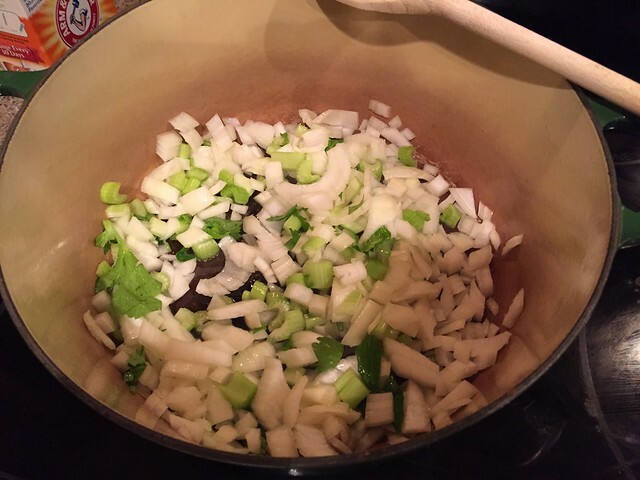 Heat 2 Tablespoons of olive oil in a large pot over medium high heat and lightly sauté the celery and onions. I originally made up this recipe after leaving my friend Larry with 2 pounds of baby carrots leftover from making veggie trays for a concert reception. We were trying to figure out what to do with 2 pounds of baby carrots and the idea for this soup was born! 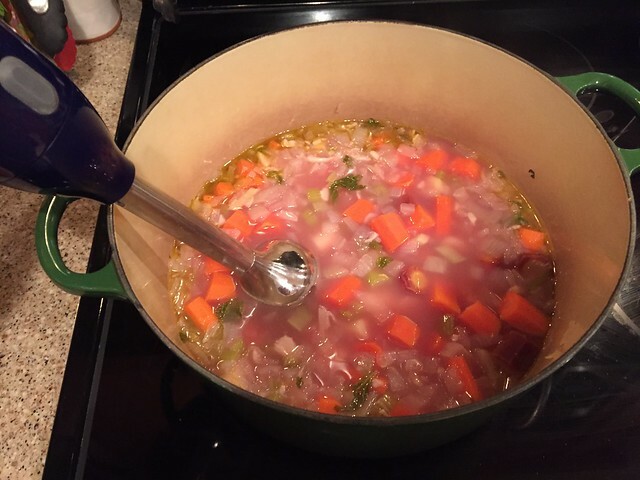 Then at Thanksgiving I went crazy and bought 6 pounds (SIX) of these groovy mulitcolored carrots at Trader Joe’s so I made this soup again. 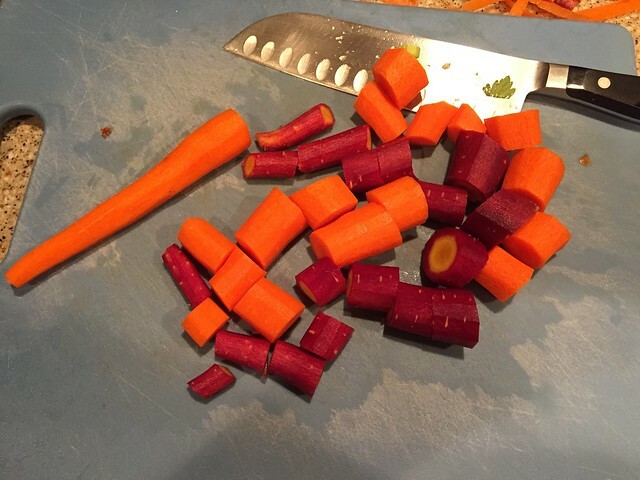 If you have the baby carrots, you can just cut them in half and be done. Since my carrots were bigger, I decided to peel them and cut them into smaller chunks. Just try to get them approximately the same size and thickness so they cook at the same rate. Whatever carrots you use, you’ll need 2 pounds. 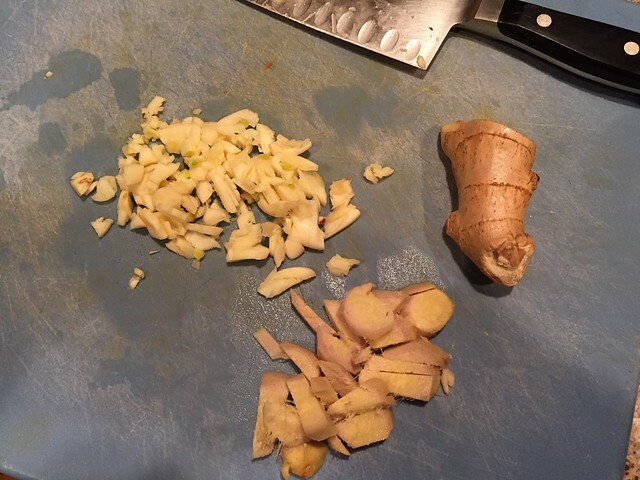 You also need some chopped garlic (about 4 cloves) and about a 2 inch piece of fresh ginger, peeled and chopped. Add the carrots, garlic, and ginger to the pot. Pour in 4 cups (1 – 32 oz. carton) of vegetable or chicken broth. I’ve made it using both and actually prefer the flavor or the all vegetable version. Bring the pot to a boil, turn the heat down to low, cover, and simmer for 20 minutes or until the carrots are tender. Once the carrots are fork tender turn the heat off. 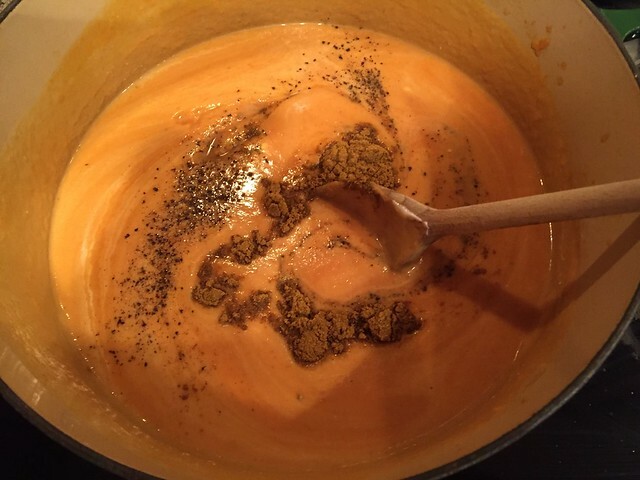 If you have an immersion blender use it to blend the soup directly in the pot until it is completely smooth. You’ll quickly discover that the trick to the immersion blender is not to pick it up out of the pot while it is running. Seems obvious but I bet we’ve all splattered soup all over the place not thinking about that particular little tip. Also, it’s worth mentioning that the blades on these blenders are incredibly sharp. Never touch them while they are plugged in. My best friend had a freak accident with hers when she dropped it and severely cut herself. Thankfully she and her finger are okay but it was very scary! I like to use a wooden spoon while I’m blending to be sure I’m not missing any big pieces of carrot. If you don’t have an immersion blender, you can always blend this in a food processor or traditional blender (what I like to call the margarita blender). Just remember that hot liquids expand so work in small batches and transfer them carefully to another pot once the soup is smooth. Turn the heat on medium low and add 1 (14 oz.) can of coconut milk. Even though I’m trying to keep this light and healthy, I use the full fat coconut milk. The light coconut milk tends to separate and curdle when it gets hot. There’s nothing technically wrong with it but it doesn’t look very nice all lumpy. 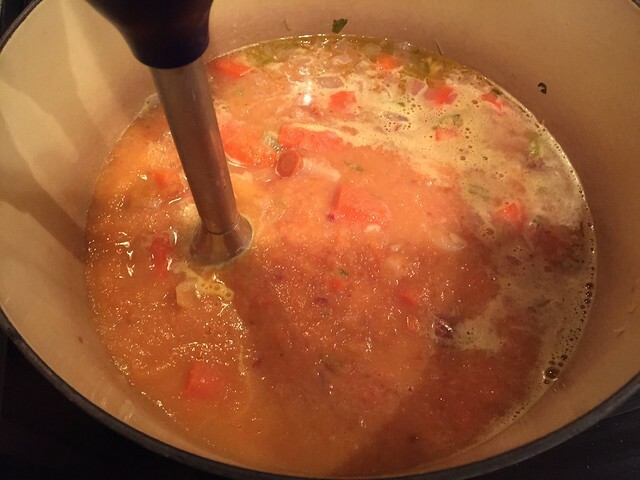 Season the soup with salt & pepper to taste then add 2-4 teaspoons of curry powder. Depending on the brand, all curry powders will taste different and have different levels of flavor and spiciness so start out on the low end and you can always add more. I like this to have a distinct carrot flavor with just a hint of curry so I usually end up with about 3 teaspoons of curry powder in my soup. If you want a much more pronounced curry flavor, you can add the curry powder in the very first step with the onions so that it can sauté and “bloom”. There is no need to boil the soup since everything is already cooked through. Just reheat it gently until you are ready to serve. Ladle the soup into bowls and garnish as desired. I’ve added a few chopped green onions, a splash of basil oil, and a few drops of sriracha sauce. If I’d had it, I would have added some chopped cilantro too. This has quickly become one of my favorite soups. Because there is no meat, it cooks quickly and easily so you can have this on the table in about 30 minutes. As I mentioned, it’s also great leftover and makes quick and easy lunches or dinners on the go. Our family has a tradition of having soup for Christmas Eve every year. 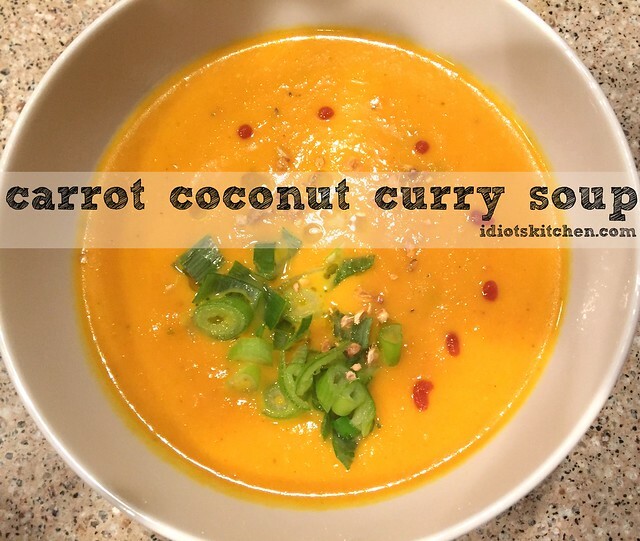 If I don’t make my dad’s traditional Steak Soup Recipe, I might switch things up with Carrot Coconut Curry Soup again this week! Good wishes for a festive season. Thanks for all the great recipes you have shared! Thanks! And many thanks for your friendship. Happy New Year! The best way to peel ginger is to scrape it with the edge of a spoon. I was doubtful until I tried it–if only peeling anything else were so slick. That IS a great tip. I usually end up peeling mine with the vegetable peeler or just a paring knife but the spoon would be much less dangerous with something knobby like ginger. I can hardly wait to try this soup! I really love it. 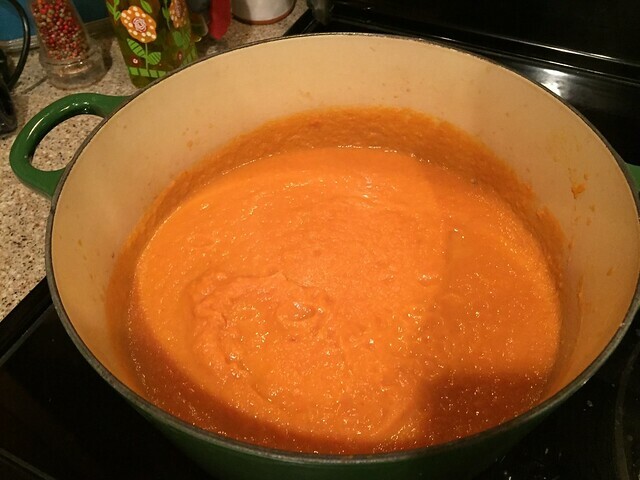 I may have gone on carrot soup overload before the holidays but it’s so good! I almost forgot to tell you, but this was excellent! Carrot soup is nice to have around and an easy way to eat some more veggies. And it did freeze well.